Here is a title generator for Final Cut Pro X. Movies folder of your home directory. Add “Titles By Mikey” to the Transition Folder. Thanks for all the time to do this. It´s a great page. 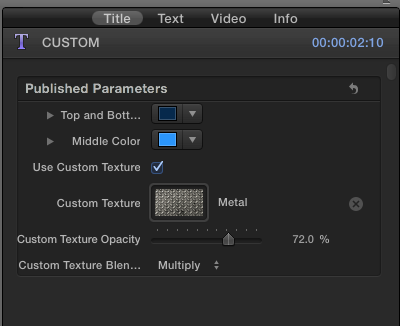 Due to a bug in Motion to FCPX, I had to leave the Check Box for texture enabled so it will show up in FCPX. To add text first turn off the Check Box, then Enable if needed to add a custom texture. I have two of your installers in my download folder but they will not download because they are not Mac apps. Where do I go from here. Superb effects and tremendous accompanying videos, a huge thank you for sharing your talent. Thought I ought to mention.. The website link is to the band I am a member of and at bottom of the page are two videos I created using FCPX. My FIRST TWO EVER! Was great to have a project to get my teeth into and although a fairly steep learning curve I absolutely loved it! Inspired me to learn more about the programme and it’s community, that’s how I discovered your awesome site. Many thanks again for your generosity.